of the regular foam generator). Both of the EABASSOC Foam Generators use the 'dry' method of producing foam, this is where foam is created by forcing a mixture of foaming agent and water through a plastic mesh with compressed air. The foam created using the dry method is uniform and very stable. In contrast, the 'wet' method of creating foam, which is based on the Venturi effect, does not produce such good quality foam. Water and EABASSOC Foaming Agent are fed separately into the EABASSOC Foam Generator which mixes them in the correct ratio (see diagram below). This mixture is called the pre-foaming solution. Pre-foaming solution and compressed air are fed through a lance which creates a stiff white foam with a volume 20-25 times that of the pre-foamed solution. The foam is then mixed into the mortar slurry in a suitable cement mixer to make EABASSOC Lightweight Foamed Concrete. An automatic timer is built into the EABASSOC Foam Generator enabling easy production of identical consecutive batches. EABASSOC Foam Generators are totally safe, having no electrical parts and are entirely air operated. This diagram illustrates the features of the EABASSOC Foam Generator. 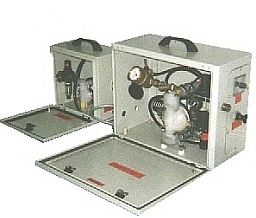 The EABASSOC Foam Generator is powered by an air compressor. EABASSOC Foaming Agent, water and compressed air are combined to make foam.